This tea room is situated within a converted stable block and offers savoury meals, teas, coffees and soft drinks alongside the traditional cream teas. Also offered are breakfasts, baguettes, salads, Panini's, toasties and a large selection of cakes. The scones, like Peggotty's in Tenterden are like saucers. The tea room is light and airy with lovely tables and chairs. Old stable block beams with brick and stonewalls make this little tea room a nice venue to take friends and family for an afternoon tea. 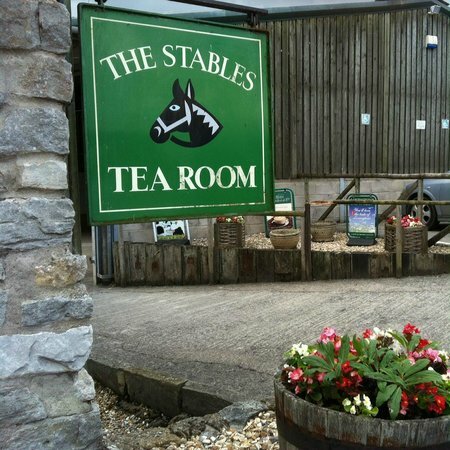 The tea room itself is a proper stable block converted to this lovely tea room. It reminds me of our lovely kitchen at home with the beams and layout. Table seating is also offered outside below a wooden lean-to which reminds me of my office – similar building and lean-to and would be a nice shaded area to enjoy during the hot summer months. There is also a selection of gifts and cards on sale as well as pictures on the walls. Although, sadly a self service tea room, I still can recommend the New Manor Farm Stable Tea Room and loads of free on-site parking.